British niche line Miller Harris has launched Violet Ida, a new fragrance inspired by the Graham Greene novel Brighton Rock. Envelop the senses in the addictive aroma of Miller Harris Violet Ida Eau de Parfum Spray, a comforting yet sultry woody floral scent inspired by Brighton Rock. A fragrant confection inspired by the contrasts, colour and nostalgia found within the much-loved novel by Graham Greene, Violet Ida is a warm, evocative and sensual scent that captures the intimacy of a powdered kiss at the end of a pier. Wistful top notes of Italian bergamot and carrot oil blend effortlessly together, scattering over the wearer in a burst of rich vibrancy before a voluptuous heart of orris beurre and heliotrope take centre stage, calling to mind images of powdered makeup and soft fabric. In the dry down, lashings of vanilla offer an intimate sensuality, enhanced by a warm embrace of liquid amber that is sure to linger on the skin long after spritzing. 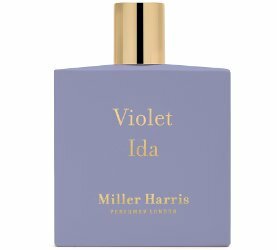 Miller Harris Violet Ida is available now at Escentual in the UK, in 50 or 100 ml Eau de Parfum. Sounds lovely. I also love the color of the bottle, which may be influencing me. Color of the bottle definitely got me. Yes, it’s a very odd novel to pick, in fact, offhand, not sure I need any of my perfumes to be inspired by anything GG wrote, although I’ve read most of it and some of it twice. Then again, I don’t mind. Yes. Hard to say what the thinking is. I’m guessing they assume no one will have read it? Gosh, I really love that bottle, and the perfume sounds really nice too. I haven’t kept up with new Miller Harris releases in a long time, ever since they seemed to lose distribution in the US.